…two important charities that may help you someday, at no cost. How about THAT for a deal? This is the final offer (30 days left) of the long sleeve 20th Anniversary “The Secret List” charity long sleeve shirts-and we are asking for your support. 100% of the profits from the Firefighter owned company, Ten Three Graphics, have been evenly split (over $10,000.00 so far ! ) between The Ray Pfeifer Foundation and the Firefighter Cancer Support Network. -The FF Cancer Support Network unequivocally and incredibly supports every Firefighter fighting cancer, along with providing prevention training. -The late Firefighter Ray Pfeifer was a dear and long time friend of ours and so many. Ray died in the Line of Duty from 9/11 Cancer. He may be best known for (while in his wheelchair, as he was dying) cornering politicians in Washington DC, forcing their support of on going funding for 9/11 responders, who like Ray, are fighting for their lives. The foundation, named for Ray, now provides supplemental assistance to 9/11 responders who are now fighting for their lives. Naturally these are on EVERYONE’S WISH LIST. These shirts make a wonderful gift – while supporting two very important charities. Please consider ordering—every cent above cost goes to the Firefighter Cancer Support Network and The Ray Pfeifer Foundation. No one wants a tie. 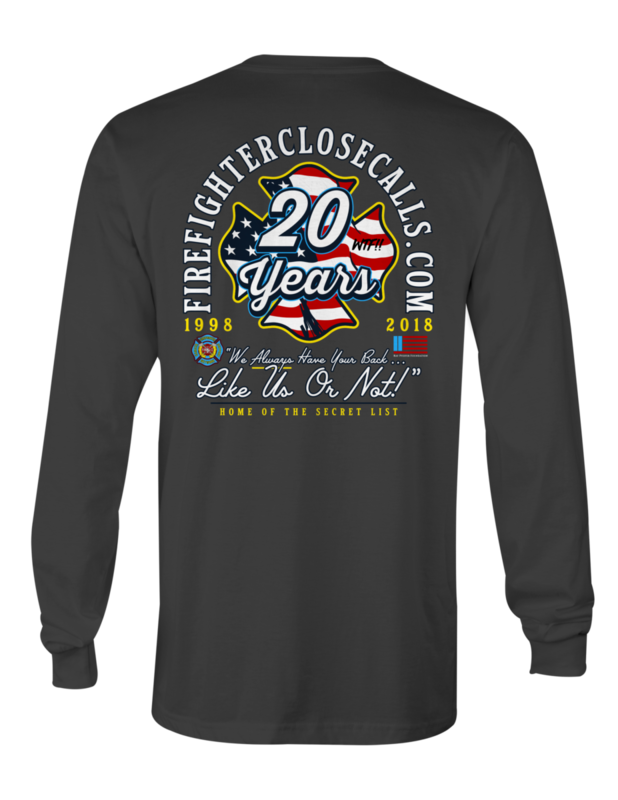 Few want your “home made” fruit cake (and we mean that with all due respect)…however,, everyone wants a 100% cotton long sleeve t-shirts-especially ones that support these two important Firefighter charities. Please help out by buying some today as we will be done with this 2018 project in 30 days. Our sincere THANKS to the Firefighters who own and run Ten Three Graphics, for their amazing support of this project – and to you, the members of The Secret List, for your phenomenal support. In hope that everyone had a wonderful Thanksgiving.